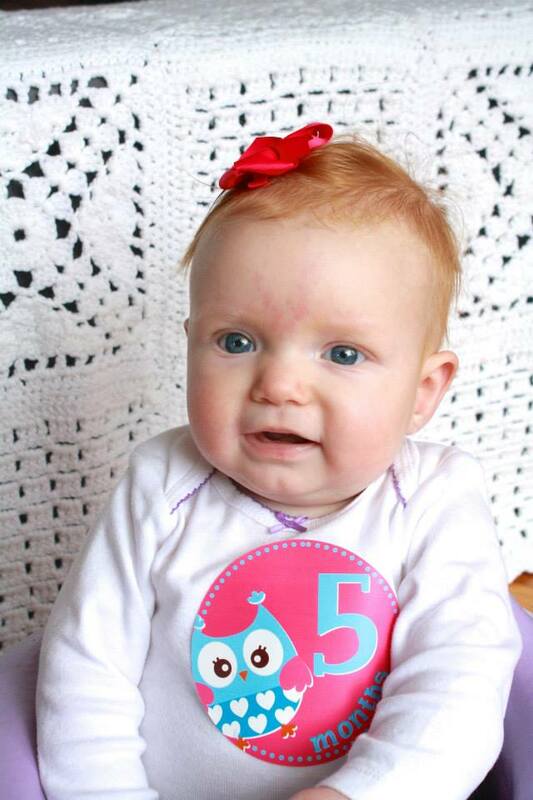 Charlotte’s fifth month flew by, as they have a tendency to do:( Stop growing up, Little Miss! But, what a fun month it was. To kick off her fifth month, we had her four month well check-up and shots (a little late). 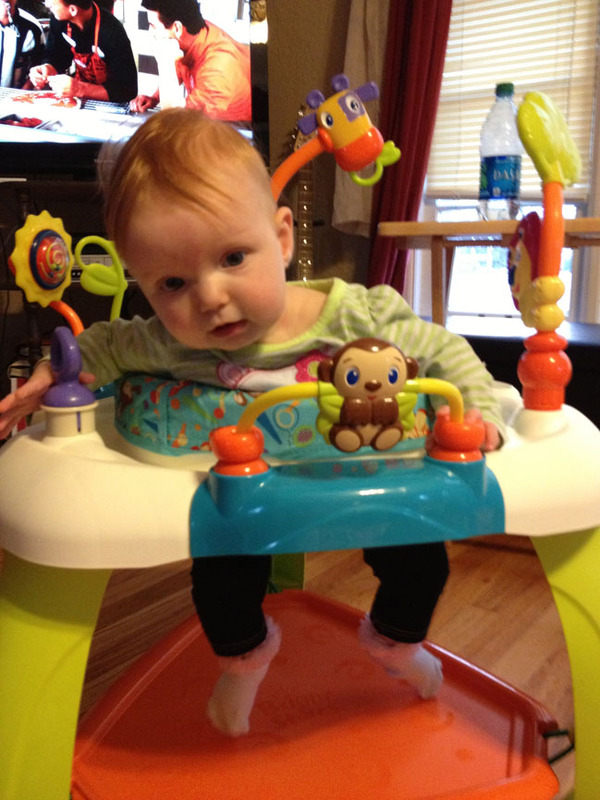 Miss C was in the 50th% for weight and the 71st% for height. I wish I could say the same thing about myself. She loves to talk and laugh, spends hours discovering her hands and feet, is mesmerized by our cats and her toys, splashes in the tub, rolls from back to tummy (when she feels like it), is getting close to sitting up on her own (I think) and we just can’t get enough of her! What fun we had in October/November. 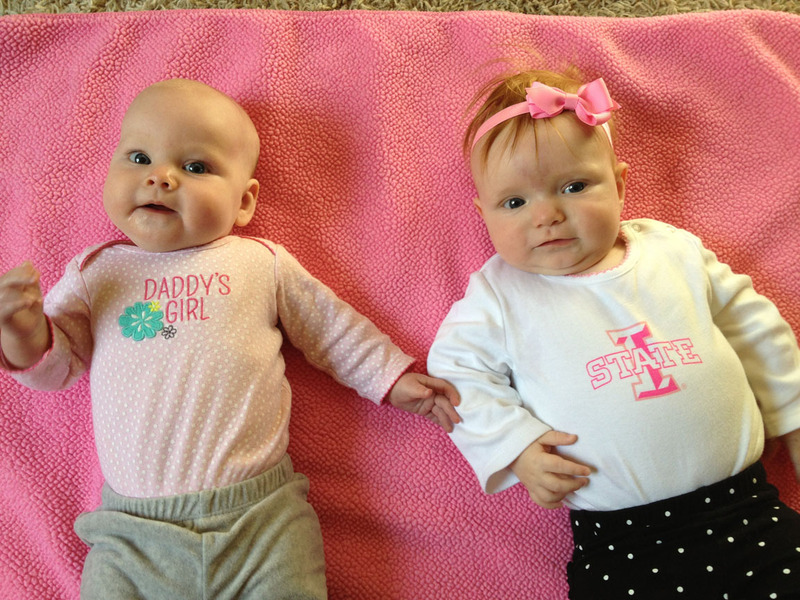 At the beginning of her fifth month, I dropped by the Take2 Sale at the State Fairgrounds. 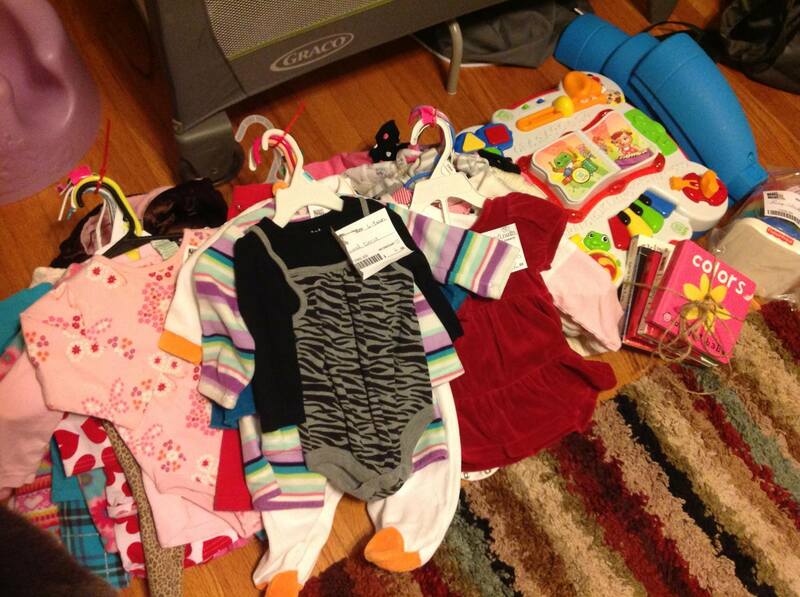 It’s a HUGE consignment sale they have with children’s items each fall and spring. I WILL BE GOING AGAIN! I got a ton of cute clothes, in good condition for her. I also got a music table, a couple of toys and some books. All in all, I filled the back of my SUV for $100. Parents in the Des Moines area – go to this. The next one is May 1-4. With my brother home for a couple of weeks from the Army, we headed to my hometown for the second weekend in a row to visit. Not only did we visit – we also attended his wedding to new wife Niki. 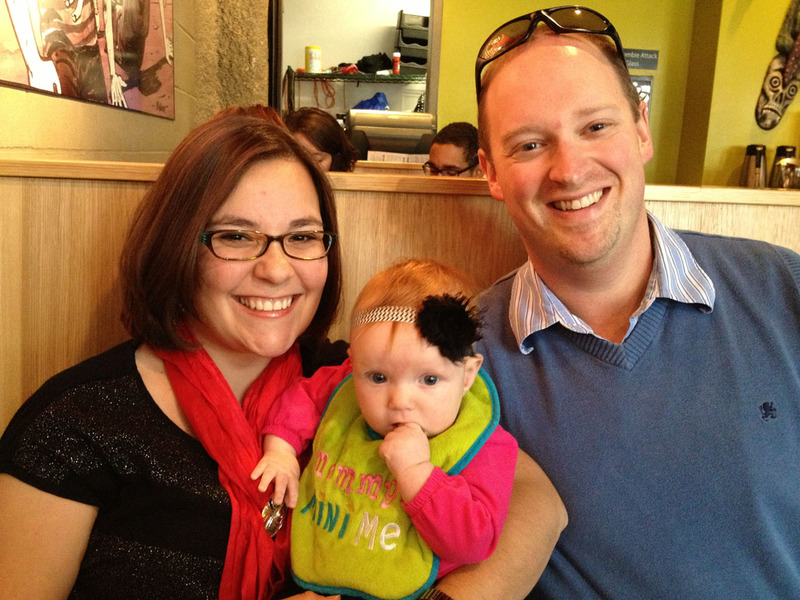 We also welcomed Niki’s daughter Allysa to our family. It was a beautiful day. In between the wedding and the reception, we joined my cousin and her kids, my sister and nephew, and my mom at Pierce’s Pumpkin Patch. Charlotte slept through some of the festivities, but she had a great time looking around at all the pumpkins and the people while she was awake. And, we got some fun pictures. With Mom, Grandma Melody, Aunt Haley and Cousin Dallas. With Dallas, Maci and Drake. Later in October, we traveled north to Luke’s parents’ farm to celebrate his dad feeling better after a long stay in the hospital. We also celebrated with Luke’s Aunt Marge because 17 years ago, she gave her kidney to his dad. The kidney was recently removed due to cancer, so this was sort of a “thanks for being a great kidney for 17 years” party. It was great to have Luke’s five siblings plus spouses and children there as a family. And, Charlotte is just infatuated with everyone:) We are blessed that Marge did such a great thing for Grandpa Curt. Become an organ donor today! Oh – Grandpa Curt and Uncle Chris are so interesting! Grammy and Grandpa with the grandkids. Charlotte with cousins Becca and Ethan. The Evans kids plus grandkids. 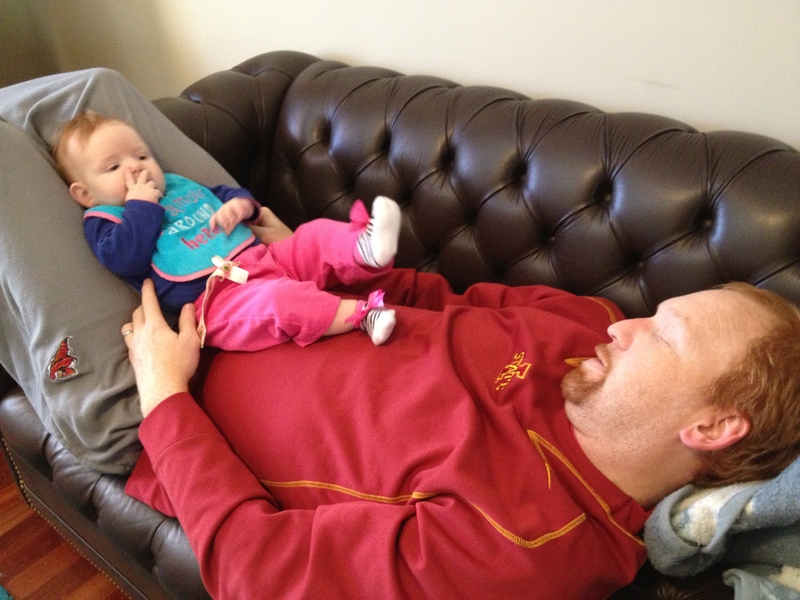 Char got to spend time the next weekend with Uncle Chris and Aunt Joy while Mom and Dad went to Ames for the Cyclone football game. Her cousins Lea and Connor even stopped by during the afternoon to entertain her. We continued to go for walks for as long as we could until the weather got too cold. Charlotte just loves going for walks and thinks Mom is pretty funny. Check out our silly little girl in this quick video. October brought my first trip away from my baby. I went to Dallas, Texas for a two-day conference. Of course, I missed her terribly, but she was just an angel for Dad while I was gone. I visited the Texas State Fair while we were in Dallas. I much prefer Iowa’s:) And, let me tell you – you haven’t lived until you’ve had your breastmilk scanned by the TSA! Ha. I had a lovely time reconnecting with peers in my industry, but I sure was glad to come home to Miss Char and Daddy Luke. On one fairly warm fall day, we headed to a park nearby and our talented photographer friend Rachael Hall took our pictures. I just wanted a couple of family pics in the leaves and that’s what we got:) We love how they turned out. 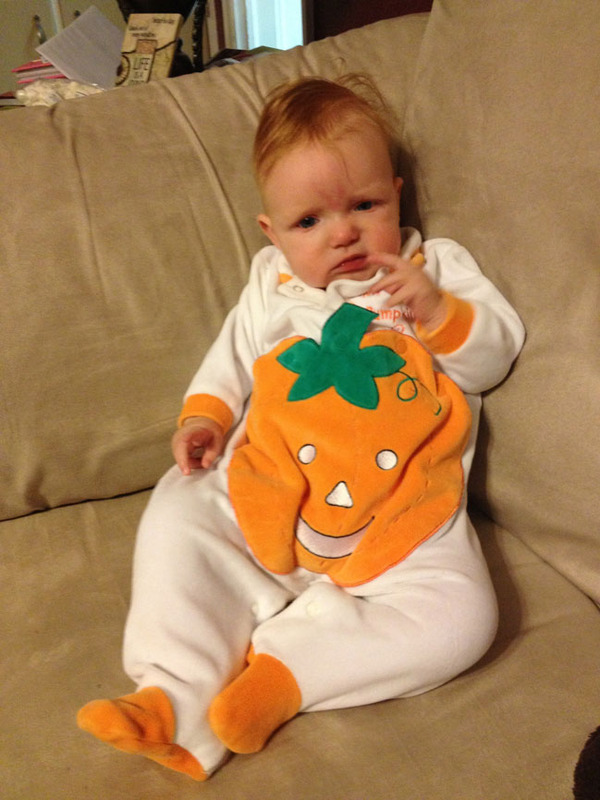 I bought Charlotte some pumpkin pajamas at the Take2 sale for $1. She was not a big fan, but that’s why consignment is so great! For Halloween, Charlotte was an adorable little unicorn. It was so stinkin’ cute. The first time we put the costume (from Old Navy) on her, she giggled a lot. But, then she was a little more subdued – I think it was probably too warm. She wore it for a little bit on Beggar’s Night. And, then she wore it a little while for the daycare’s Halloween party the next day. She was the cutest unicorn I’ve even seen! The weekend after Halloween, we met up with our friends Scott and Martha at Zombie Burger before they headed to WICKED. Whoops – my big mouth spoiled the surprise for Martha. But, all in all, Charlotte got to meet some awesome people and we had some good food. And, Charlotte will be so excited when their second kiddo – a boy – is born this spring. Charlotte also got to play with her friends Eli and Rowan while their parents babysat one Saturday. Mom and Dad were at the Iowa State Homecoming game. What fun those babies have together! Also, later in the day on baptism day, Charlotte sat in her big play center for the first time and was truly mesmerized. Okay, I’m super impressed by the cake you made! It’s so professional looking!